Use the map at the bottom of the page to get a good idea on our location. Lake Bolac is a great location where you can get out and about each day and explore our amazing countryside. We are only a small motel with 8 rooms so you are strongly encouraged to book early when planning your stay to avoid disappointment, particularly during our busy times and when local events are on. The easiest way to secure your booking is by pressing on the ‘book now’ button above. Alternatively, you can contact us on 03 5350 2218 during business hours and one of our friendly staff will be happy to make the booking for you. The price and availability is exactly the same either way you choose to make your booking. We are very proud of our bookings.com awards which we have maintained for 4 years running through guest reviews. Thank you for everyone who has been kind enough to leave us great reviews and greatly helped us in growing our business! 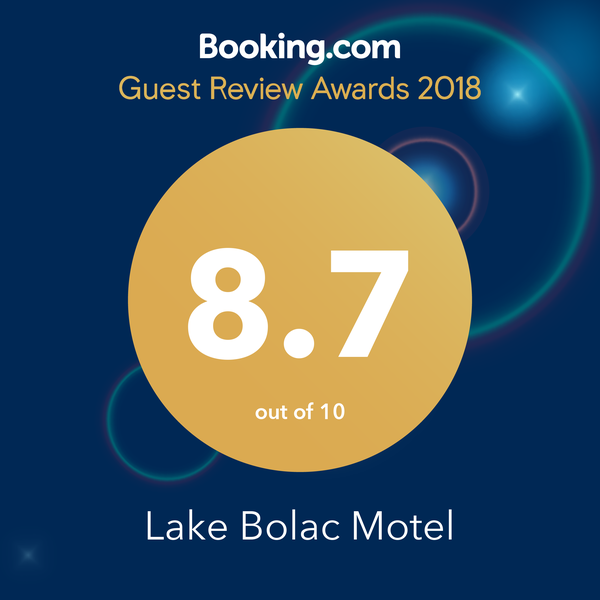 We also won award scores of 8.7 in 2017 and 2018 through Booking.com guest review awards. If you haven’t already, please like us on facebook so you can stay up to date with our latest posts, offers and local events. We recommend Bookings.com to compare prices and search for alternative properties (if we are booked out or cannot provide accommodation for your group size/dates, etc.